My book was published this July and I got my first royalty statement soon after. My contract with Galileo Press was executed in the US and hence this required me to apply for a TIN to get the actual payment as well as claim tax exemption from the Indian Government. The process, it seemed, was simple, fill a couple of forms and mail it with a notarized copy of my passport duly apostilled by the Ministry of External Affairs. And this is where it all began. 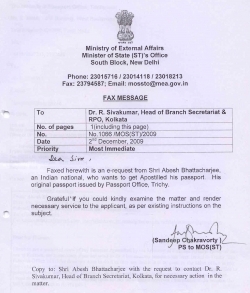 A visit to the MEA office in Kolkata got me the response that since my passport was issued in Trichy (It was issued while I was still in college), I would need to visit the passport office there and get it verified (?). Somewhat perplexed, I landed up in Trichy Passport office who told me that I would need to visit the Chennai MEA office to get my passport apostilled. At a loss for what to do I called up the MEA office in Kolkata again seeking for help and the response that I received floored me. It was not under their “jurisdiction” to get my passport, which was issued in Trichy, apostilled. I would need to go to the New Delhi office instead. All attempts to argue over the fact that that my passport was a central government issued document and not a state government issued one and hence should be verifiable from anywhere in the country only yielded curt and irritated replies and this was where I almost gave up. Not quite. I had been following our Minister for External Affairs, Dr Shashi Tharoor on twitter for quite a long time and have been thoroughly impressed by him. Before that I liked him as an author and his Great Indian Novel has been a favourite sice college. The respect and admiration increased when I had the chance to meet him at a Tweetup in Bangalore. I decided to reach out to Dr. Tharoor for help. I mailed him and everyone in his office whose email I could gather explaining my apostille woes to him. Not that I expected a reply. I mean, I was one of the many that maybe reach out to him every day with more complicated problems and he is a busy man. On top of that the indian government is not known to be internet and email savvy though it seems things are changing. I waited. Please refer to your mail for getting your passport apostilled by MEA authorities. In this connection, we had written to the Head of Branch Sectt, Kolkata, Dr. R. Sivakumar (copy of our communication is attached herewith). After accepting your application, they can verify the particulars from PO Trichy as the passport is issued by them and render the necessary service to you. PS: Sorry for the delay in reply. I had given the fax to my colleague to scan the fax and send it you by e-mail, however, it got skipped. Elated and over the top, I reached out to Dr Sivakumar in Kolkata, set up an appointment and met him. He turned out to be a very nice gentlemen and eager to help. I was directed to Mr Sagar Maitra, the Administrative officer of the MEA office in Kolkata and I met up with him. A very nice and knowledgeable person who loves to talk about everything, Mr Maitra and I chatted over various topics from literature to religion for over an hour and by the end of it I had an apostille stamp on the notarized copy of my passport. This incident did change something. It changed the way I perceived how the government works. This led me to believe that maybe all is not lost and things still work as it should in India. Lastly it instilled a firm belief that at least someone from the government is trying to actually walking his talk of “demystifying the governance process”. Thanks a lot Dr. Tharoor. I would vote for you.